*Update* Added EQ, minibrowser, and other small fixes. Thanks for all of the suggestions. Enjoy! Simple, clean design. Orange and blue? Oh yes. 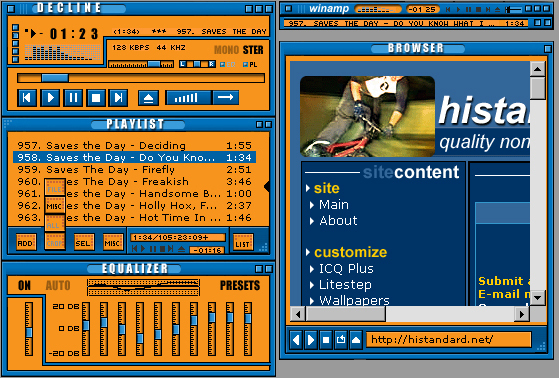 My first skin for winamp. Ported from my icq+ skin. After making this skin I gained a new respect for people who skin winamp; it's A LOT harder than I thought. Nice colors! I also like how it's easy to read and use the main player controls. In the end, I tend to prefer skins like this that are very functional. Orange and blue... My favorite colors. I agree with you Xymantix, very functional too. When will we see a Decline Windowblinds skin? i've been working on decline windowblinds skin for a little bit. Look out for it soon!! hmm... must just be me, but i cannot seem to get the equalizer to work..